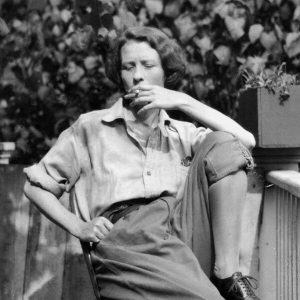 The Catskill Geologist – Page 4 – "I will never kick a rock"
Many, perhaps most, poets are like Edna St. Vincent Millay; they celebrate, and even live, the quick passage and rapid burnout of life. But geologists are different; we appreciate the endless nature of time and the slowness of the changes that it brings. Geologists and poets are alike, however; they both seek out truths that lie just beneath the surface. My wife and I found this out when we visited Poetry Walk, just down the road from “Spindletop,” Millay’s home in Austerlitz. The walk had originally been a farm path, carrying cows and firewood. Vincent (as she rather insisted upon being called) valued the walk for its bird sounds, birch grove and mountain laurels. It came to be even more spiritual when her mother Cora was buried there. Vincent and her husband Eugen Bossevain eventually joined Cora in repose at the end of the trail. There was more; a geologist can deduce much from a few rocks. There may be little poetry to words like phyllite and metagraywacke but there is much meaning. The phyllites were mud before they were shale; the metagraywackes were sand before sandstone. And that mud and sand once lay at the bottom of an abyss, the deepest realms of the deepest oceans. Eventually a great mountain building event did the crushing and cooking. Was I geologist or poet? I had been metaphysically transported to the darkest and deepest realms of an ancient ocean while mountains rose around me. All the while I was physically standing on a modern forest trail. The end of the trail brought an end to some of my mysteries. Millay and her husband were buried there and a boulder serves as their gravestone. It is a fine metagraywacke with a large thick seam of quartz running along one side. I looked it over carefully and also found numerous small seams of quartz. The gravestone was a large piece of the Walloomsac, truth that had been brought to the surface. It had been mud and sand in the depths of an Ordovician age abyss, about 440 million years ago. Those sediments had hardened into rock and then they had been cooked by a mountain building event, probably the one called the Taconic Orogeny. Still later these rocks were fractured and hot groundwater penetrated the cracks. It was then that large and small seams of nearly pure quartz had crystallized and filled the empty space. It’s autumn and once again the leaves are in color. This annual event has not always been. Autumn color is a characteristic of today’s advanced deciduous trees, but there was a time when the world’s forests were composed only of the most primitive plants. In fact, there was a time when there were no forests at all. We New York State paleontologists get to see the transition from a world without forests to one with them. We have very old terrestrial deposits here, Silurian in age, which have no fossil trees at all. Then there are the Devonian age Catskill red sandstones. They are only about 40 million years younger, but they have a great abundance of fossil trees. During the interval, trees evolved and spread out across the Earth as the first forests. Fossil trees this old are extremely rare, but you can go see some of them yourself, and enjoy a fine autumn drive at the same time. Take Rte. 28 to 42 from Shandaken to Lexington. Then take Rt. 23A west until you reach Grand Gorge. Take Rt. 30 north 2.8 miles and turn right. Go downhill another 1.2 miles and you will reach Schoharie Creek where it passes through the village of Gilboa. Just before the bridge is a little park with seven fine fossil tree trunks. This humble site is one of the world’s most famous fossil locations, the Gilboa forest. The Gilboa forest was discovered after the terrible Schoharie Creek floods of late 1869. Extensive erosion along the river ripped through the soft shales and exposed a number of fossil tree stumps. The discovery caused quite a stir and well it should have. This was the oldest known fossil forest; before them nobody had ever guessed that trees were this ancient. It got better in the early 1920’s. Excavations for the Schoharie Reservoir revealed about 200 more fossil stumps. The trees in the little park were among these. The famous Gilboa fossils offer us a rare view of what forest ecology was like very early in its history. Gilboa was forest of trees, most of them called progymnosperms. 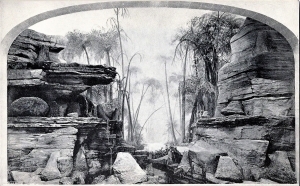 In common terms that means that these were essentially very big fern-like trees with tall wood stems (trunks). In time they would evolve into today’s common cone-bearing trees, called gymnosperms. Beneath the trees was simple ecology of even more primitive plants. Hiding among them was an animal ecology of simple arthropods. These were an abundance of centipedes, millipedes, and simple insects, along with many truly exotic creatures. One of note is that Gilboa is the home of some of the oldest known fossil spiders. This is certainly a peculiar, but truly remarkable distinction for a small town. Spiders are among the most abundant and successful groups of invertebrates on the planet and some of the oldest one are from right here! There are ironies in the story of Gilboa. The trees are a metaphor for the great cycles of time. They grew not along the Schoharie, but along some ancient nameless stream of the old Catskill Delta. They were long ago buried in the muds of a long-forgotten flood. There must be a story here: What kind of flood was this? How bad was it? There is no answering such questions. For hundreds of millions of years, they lay entombed in those flood sediments. During that time, they hardened into rock. If it was floodwaters which buried them then it would be flood waters which would release them. These trees of stone lay in wait for the day when another awful flood would bring them back to the light. The last irony came when so many of them were once again submerged in the waters of the Schoharie Reservoir. It doesn’t take much to get a geologist to go outside, but in autumn we find ourselves ever more drawn outdoors, especially as the season progresses. There is something compelling about the annual foliage scenery. There are only so many leaf seasons in a lifetime and to waste or miss one seems a sin. Each is something to be savored. The Blue Trail takes you south to the Layman Monument. Poor Frank Layman died there early in the 20th Century while he was fighting a forest fire. They have cut the foliage there so that his monument has a fine, but distant, view of Haines Falls. 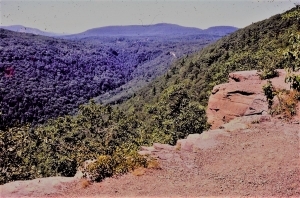 Beyond the monument, the trail turns east and soon brings you to the brink of Kaaterskill Clove itself. 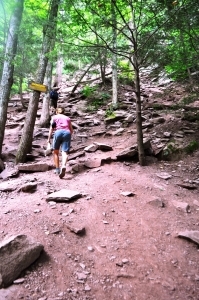 If you have not been here before, be prepared for a great surprise; Kaaterskill Clove is a lot bigger than you imagine. It’s about three miles long, a mile wide and a thousand feet deep. The slopes are steep, dropping those thousand feet in less than one half mile, and the visual impact of this makes the clove seem bigger than it is. On an autumn day the clove is at its best, deep, rugged and picturesque. Hike eastward and the Hudson Valley soon comes into view. Continue along the blue trail and you soon pass some large rocky knobs which caught the eye of Thomas Cole. 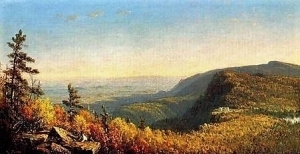 The renowned Hudson Valley artist painted at least one canvas right here. So did Sanford Robinson Gifford. There is of course a geological story here. 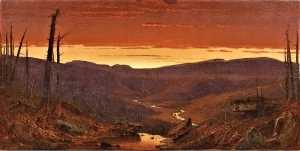 The great canyon is a relatively new landscape feature. A hundred thousand years ago, or so, the Hudson Valley was glaciated, filled to the brim with a stream of ice called the Illinoian glacier. This river of ice passed the escarpment of the Catskill Front which was, back then, unblemished by any large canyons. Only after the ice melted did Kaaterskill Creek form and start to erode its deep canyon. That makes the clove less than 100,000 years old. Big as it is, the clove is extremely young by geological standards. Inspiration Point is just a little farther down the clove. Look for a fine platform with a cliff in front. People have found this the best place to take in the clove’s view. Landscape artists have seen the same. But Geologists have discovered that this is the best place to understand the glacial history of the clove. Look at that platform carefully; it has been scoured by the passing ice into a beautiful smooth polished surface. It’s only marred by the striations gouged into it by the passing ice. The cliff here is the product of glacial work. It faces westward and was formed when great masses of rock were broken loose and plucked away by the passing and westward moving ice. 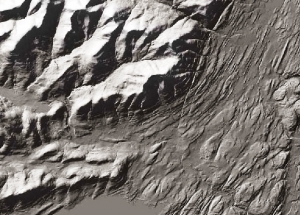 About 18,000 years ago the Hudson Valley witnessed another glaciation. Once again, a great stream of ice, the Wisconsin glacier, flooded the valley. This time some of the ice branched off and flowed westward up Kaaterskill Clove. This stream of ice would not stop until it reached nearly to Prattsville. It’s this ice that made Inspiration Point. Gaze down to the bottom of the valley and then to the other side of the clove. Look up and down the valley. When you realize that all this was filled with moving ice you begin to get a sense of just how great an event this glaciation was. For a century and a half hikers and artists have come here to marvel at the landscape as it is; geologists come here and marvel as to how it was. I went and saw Jurassic Park recently. I happen to be a paleontologist, so I thought that it was about time I saw the kind of life that I should be leading. The movie was a lot of fun and there was plenty of action and adventure. There were good-guy paleontologists and bad-guy paleontologists which is an angle I had never reflected upon before. I have enjoyed my own career in fossils very much so far, but it is clear, from this vicarious experience, that I have missed out on a lot of excitement. Chasing fossil brachiopods is just not the same as being chased by a Tyrannosaurus. If you see the movie you may wonder what it was like here in Woodstock back during the Jurassic. The answer is that we don’t know. There are no Jurassic age rocks in this area. No rocks/ no history is the way it works in Geology. Nevertheless, it is fair to speculate as to what it was like around here way back then. And, in fact, there are some Jurassic age rocks not all that far away. They can tell us a lot. It was the Jurassic and the earlier Triassic times that witnessed the origins and early history of the dinosaurs. In New York State there are late Triassic and early Jurassic sedimentary rocks in Orange and Rockland counties; there are more in central Connecticut. Only a few fossil dinosaur skeletons have been found in these sequences, but the strata are just crawling with dino footprints. 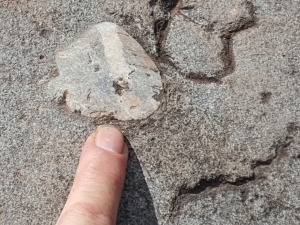 And there is an especially interesting species of dinosaur whose footprints are quite common in these rocks, a dinosaur that certainly once lived here in Woodstock. Its Latin name is Coelophysis, and it was a very fine specimen. It belonged to a group called the ostrich-like dinosaurs. Coelophysis wasn’t especially large, being only five feet tall and nine feet in length. It was, however, remarkably athletic. They were agile and light-weight, weighing in at a little more than 100 pounds. It’s probable that they were among the earliest predatory dinosaurs. 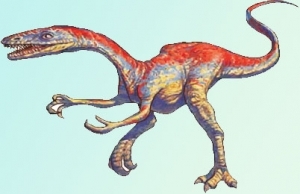 Coelophysis had small forelimbs, but they were armed with long recurved claws. Its large mouth possessed numerous, knife-like teeth. All in all, the animal would have been quite effective at ripping its prey apart, making it an excellent movie monster. But that’s wasn’t the scariest thing about this dinosaur. There are sites in New Mexico where their skeletons are so abundant that paleontologists have speculated that they must have hunted in packs. That really gets us to the Jurassic Park stereotype of dinosaurs as vicious marauders. And there may be a great deal of truth to the stereotype. I once saw a series of dinosaur trackways. They were all the same species, all the same size, they were spread out evenly, and all heading in the same direction – a skirmish line of predatory dinosaurs! I had 15 of my students place their feet in the tracks and, on signal, they all stepped forward, laughing, growling and retracing those 190 million year old trails. Dinosaurs can be fun, at least the dead ones that can’t eat you are fun. Coelophysis likely did live here in Woodstock and dinosaurs are part of our local geological heritage. It’s too bad we can’t go out and hunt their bones. I don’t know if there ever were any Jurassic age strata in Woodstock, but if so, they would have eroded away millions of years ago. All evidence of local dinos has been gone all that time. Want to see some real dinosaur fossils? Travel to Dinosaur State Park, near Rocky Hill in central Connecticut. There is an outdoor display of footprints there. Maybe one of the dinos that left its footprint in Connecticut came from Woodstock. We encounter many natural wonders in this field of geology and too often we take them for granted. There are so many things preserved in the rocks that really should not exist. Dinosaur footprints are good examples. How could something as ephemeral as a footprint in the mud be preserved 100 or 200 million years after they formed? The answer is that they really shouldn’t; it’s a one in a million chance. But what if there were ten million dinosaur footprints? Then ten of them would be preserved. If there had been a hundred million dinosaur footprints, then a hundred of them should still be around. One in a million shots become certainties if you just play the odds. And geologists must learn to play the odds. Pretty much all of the fossils we find were originally one in a million shots. They were bones or shells or tree trunks that defied the odds, got buried, hardened into rocks and were found. And then, when you have a million fossils, one of them is truly a grand discovery: a complete dinosaur skeleton, a mastodon frozen in the tundra, a little frog in a piece of amber and so on. Search for fossils long enough and you beat the odds. We are used to this, but there are still things that we have a hard time believing, even if we see them ourselves. One of those odds-defying oddities can be found right here in the Catskills. They actually aren’t fossils, but the word fossil can be used to describe them. They are raindrop prints, often called “fossil” raindrop prints. What could possibly be more ephemeral than a raindrop print? The drop falls out of the sky and leaves an impact crater in the soft earth. The crater is just that, a soft rim of earth thrown up by the impact. So far, so good, but how can something like this come to be preserved? Isn’t it likely that the very next drop will destroy the crater left by the last one? The answer is yes, of course, and the next 100 or 1,000 drops will also destroy any craters left about. And after the storm, won’t the earth be too soft to preserve an impact crater? Of course it will, the ground should be all mud, too soupy to preserve any such features. And even if a raindrop print were to survive, wouldn’t wind eventually blow it away, wouldn’t animals step upon it, wouldn’t plants grow through it? Wouldn’t this and wouldn’t that! The answer is yes, yes, yes, the raindrop should be destroyed. And yet, there they are, . . . preserved in rock . . . little, bitty structures that look exactly like . . . raindrop prints! So, how did they get there? The prints are found on the surfaces of beds of red shales which are thought to have once been soil surfaces. That’s a helpful hypothesis and it adds some plausibility to the story. But, shouldn’t the prints be lost in a mush of mud? To avoid that you have to imagine a very brief shower. A few drops sprinkle the landscape and then the “storm” is over, hardly before it had begun. But what about preservation? Next you have to let the soils dry out. This doesn’t turn it into rock, but dry soil is stiff enough to resist distortion. Finally, you want a flood to occur and submerge the flood plain. Floods are often not as catastrophic as the evening news coverage would suggest. Flood waters can often rise rather passively and bring blankets of new mud to bury the old soils. That can be done without much disruption of the rain drop prints. Continue this process for a very long time, bury the prints in a deepening thickness of sediment, and it will harden into rock. With that the raindrop prints are preserved. It’s a long shot, a very unlikely sequence of events, but it is possible, and it does happen. And that’s how it is that we can go and find such remarkably unlikely features in the rocks. Such things are called primary structures. They are rather fun to watch for and they tell us so much about what the rocks represent. We would like to tell you where to go and find some raindrop prints, but that is hard to do. Look for red shales and these are common throughout the Catskills. Then pick through the shards of shale. If you are lucky you may find some. If you are not lucky, well maybe next time. We usually think of mountains as emblems of permanence. “Old as the hills” is certainly a common enough old chestnut. It implies that the hills (and mountains) are just going to be there forever and ever. That may not be. George Halcott Chadwick found it otherwise. Chadwick was one of the great Catskill-area geologists of the first half of the 20th Century. He spent a lot of time looking at regional maps and he gradually came to the conclusion that the eastern Catskills are, quite literally, not all there. Take a look at a good regional map. Kaaterskill and Plattekill Cloves divide the Catskill Front into three east-west ranges: the Jewett Range in the north, the Roundtop-High Peak range in the center, and the Sugarloaf to Plattekill Mountain range in the south. Each of these three ranges is sharply terminated on the east by the steep, straight slopes. It’s as if something had chopped off those eastern parts. The three eastern slopes are called “truncated spurs” and together, they define the “Wall of Manitou” of the Catskill escarpment. The “Wall” is a straight, ten-mile long front. Chadwick found that to be remarkable; he thought that the truncated spurs and the steep, straight nature of the wall required some unusual erosional processes to explain them. He believed that it was glaciers which did the job. 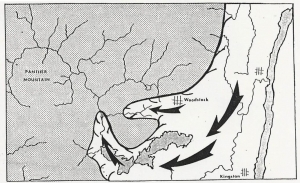 The story begins a bit more than 100,000 years ago when there was an event called the Illinoian glaciation. A massive glacier, advancing from the north, seems to have descended the Hudson Valley and gradually filled it. Picture a stream of ice, at least to the brim of the valley and probably a lot higher. In many ways it behaved like a river, the ice slowly flowed down the valley. Now some sort of a Catskill Front had already existed, but it probably wasn’t the steep straight wall that we know today. More likely, gentle slopes descended gradually, well east of today’s wall. In fact, Chadwick thought the slopes may have reached out one or two miles into the Hudson Valley. That included Overlook Mountain which would have been, Chadwick thought, about twice its present size. The passage of the ice had an erosive effect upon the old slope. Moving glaciers pluck and grind away at landscape’s bedrock. The ice likes to carve a steep-walled trough and that’s what the Illinoian glacier set about doing. The lower slopes of the Catskill Front were largely composed of soft shales and these eroded easily. The upper slopes were of resistant sandstones and these put up much more of a fight. Given time, the steep slopes of the Wall of Manitou were the result. But not before quite a bit of Overlook (and the rest of the Catskill Front) was worn away. With the return of warmer climates, the Illinoian glaciers eventually melted but the respite was brief. About 25,000 years ago the climate deteriorated again and once more a stream of ice flowed down the Hudson Valley. This has been called the Wisconsin glaciation. The whole process was repeated and again the Wall of Manitou suffered even more erosion. This had a real effect upon Overlook. We described the final stages in the process in a Times article last August (1996). The steep ledges up there date back to those last moments of glaciation. In the end, after the Wisconsin glaciers retreated, Overlook Mountain was literally half the mountain it used to be. Fully two miles of eastern Overlook were gone. It’s quite a thought, half a mountain lost. That is, if Chadwick was right. George Chadwick’s story is a fine one and we are very fond of it. We hope that it is true, but the hypotheses of science are not always so simple. Sadly, there are modern geologists who very much doubt that this is what happened. They just do not think that passing ice is capable of removing so much rock. One of the problems with their objections, however, is that they don’t have any better ideas. So–is Overlook a whole mountain or is it half a mountain? That is the question. On Rt. 9W, at Glenerie, the Esopus River descends two ledges of rock known as the Glenerie Limestone. These ledges make up what are either high rapids or low waterfalls, depending on your point of view. In any case they also make a very nice setting and the shores of the Esopus there attract a lot of people. We sat on the banks for a while and watched people go by. There were two fishermen, who had no luck. A couple walked by with their dogs. Several young boys came by on their bicycles. One elderly man wandered along the shore, we think just for the pleasure of it. Such is life for human beings who are not at work, but just intent upon enjoying a little leisure. The Glenerie Falls provides a setting to idle away a few minutes or a few hours. As I sat along the Esopus, we was watching just a few random moments in the history of life. Nothing special occurred, nothing historic or even meriting the slightest of note. Most of what goes on in this world is like that. Little that happens is really of very much significance. Such is life. It’s easy to forget that this spot has always been here. The world is four and one half billion years old and this precise longitude and latitude has been here all that time. What was it like here a century ago? We don’t know, but with the help of a historian we could easily guess. How about 500 years ago? A little harder, but good guesses might come from an Indian archeologist. How about a million? or a hundred million? or a billion years ago? Even a geologist has a hard time answering those questions. So much of earth history slips off into the past without leaving any monument or even a clue as to what had transpired. But none of these moments is likely to have amounted to much, just simple events during average times. Countless living creatures have passed by the Glenerie Falls site and almost all are gone and have been entirely forgotten by history. Disappearing into the oblivion of the past is a sad fate that we all share eventually. . . almost all. But sometimes, hundreds of millions of years after their deaths, signs of the lives of ancient creatures return to light. And we mean that very literally. Memories of ancient organisms are often revived when weathering and erosion of bedrock brings to surface the evidence of lives long lost. 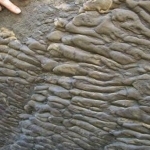 We geologists call these “trace fossils.” They are not the bones or shells of ancient organisms, but the evidences of ancient activity, the very behaviors of the past. 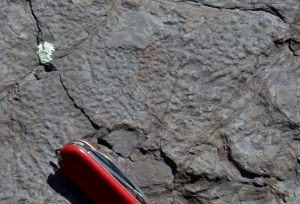 The best known trace fossils are dinosaur footprints. People have marveled at them for more than a century. They forget that these “marvels” are only evidence of the most every day and literally pedestrian moments in the lives of dinosaurs. Unfortunately we don’t have dinosaurs or their footprints anywhere near Woodstock. But we do have other trace fossils. A lower ledge of the Glenerie Limestone forms the lower cataract of the falls. The rock is tough and brittle stuff and it has held up well against the elements. On the bank, just below Rt. 9W, this ledge has been brought to the surface by folding of the bedrock. 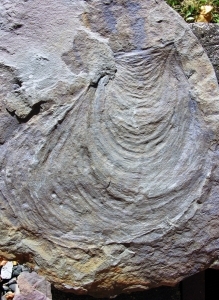 The upper surface of the inclined stratum is a fossil wonder. It’s densely littered with the trace fossils of worms that lived here about 400 million years ago. The animal has a name – it’s Zoophycos. It was a common marine worm, much like many that live today. You probably know that earthworms make their living by burrowing through soil, consuming and digesting it as they slowly move forward. Similarly, Zoophycos burrowed and ate its way through the marine sediments, including the limestone sediments of the Glenerie. Zoophycos was extremely meticulous in the way it dined on sediment. It burrowed forward for a while, its path taking it in a broad, round loop. The worm then turned abruptly and returned, closely paralleling its first path. Then, once again, it turned on a dime and paralleled its second path. Back and forth it continued, carefully consuming all of the sediment. Eventually the back and forth path took on the form of a rooster tail and that is the common name it goes by. “Rooster tails” are common throughout the marine sandstones and shales of the Catskills, but this is the first time we have seen them in a limestone. They are fascinating fossils and marvelous insights into the details of ancient life, but they record such mundane moments: Worms eating mud! The Austin Glen Formation is not all that impressive a rock to look at. It’s made up of alternating strata of gray sandstone and black shale. But in many ways, it is one of the most awe-inspiring rock units in the area. It makes up much of the bedrock on the east side of the Hudson River. Travel across the Kingston-Rhinebeck Bridge and it makes up the first outcroppings of rock you will see. These are the low cliffs on either side of Rt. 199. We made the trip recently and took a good look at these outcrops. About 30 paces east of the beginning of the west-bound lane’s exposure we found a remarkable sedimentary structure: One overhanging stratum of rock displayed a crenulated surface. We recognized the form as a type of “sole mark” and it conjured up quite an image from the past. The sands and muds of the Austin Glen were deposited in some of the deepest waters that make up ocean basins. There is a wonderful word, “abyss,” used to describe great depths in the sea. The abyssal plain is a great vast flat sea floor, about two miles down. But we are talking about something even deeper. We are speaking of a sea floor zone called the hadal zone, that’s a great deep trench at the bottom of the sea and it can be several tens of thousands of feet deep. Today’s Marianas Trench is the best such example we can go see. It is 36,000 feet deep, an incredible depth. We don’t think that the Austin Glen was quite that deep, but who knows for sure. Not only is a marine trench of this sort deep, but it is also very steep-sloped and that gets us to today’s story. You see, the shales of the Austin Glen formed originally as black muds. It’s typical for such great depths to accumulate muds; the fine clay particles settle to the deep-sea floor and make up the muds. But the sands are different; sands are usually shallow water deposits. Obviously, the sandstones of the Austin Glen weren’t shallow water deposits so how did they get there? The answer it that the sands were once part of something called turbidity currents. These are very fast-moving currents of dirty (turbid) water that rushed downslope at speeds of up to 50 mph. More likely than not, an ancient earthquake struck and displaced a large amount of shallow water, sandy sediment. Billowing masses were thrown up into suspension by the quake and then they began to flow downhill under the influence of gravity, soon accelerating to their rapid pace. A turbidity current is one of those very powerful forces of nature. Fortunately, there are few animals that stand in the way and few deaths result. There is some destruction, but only in the form of rapid erosion of sediments crossed by the current. At the bottom of the slope the turbidity currents slow down but, still moving rapidly, they spread out across the soft muds and deposits their sandy sediments. The sudden deposition of sandy sediment upon soft muds has an interesting effect. As the sand spreads out across the sea floor, it presses into the soft muds. The results are the crenulated surfaces we described earlier. They are called sole marks. There are a number of different types of sole marks and, technically, these ones are called “squamiform load casts.” Let’s not get too concerned with the exact terminology and instead try to appreciate the aesthetics of these structures. They are rather remarkable in the details of their sculpturing and we have trouble finding just the right adjectives for them. Take a look at our illustration and you will get a good impression of them. These soles are common throughout the Austin Glen Formation and, once you have an eye for them, you may be able to find others. 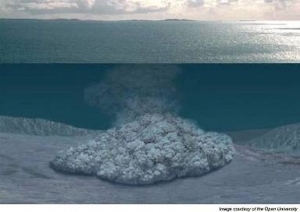 We origins: underwater avalanches, triggered by great earthquakes; it’s quite a scenario and very typical of what we find when we know what to look for in the rocks. 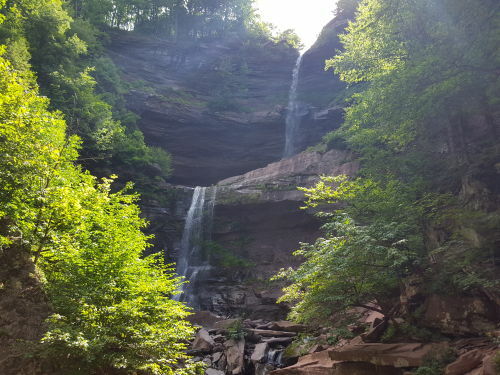 Have you been to the new trails at Kaaterskill Falls? We lobbied for this sort of thing for many years. The DEC seems to have been influenced, in part, by this column in the Woodstock Times. The year 2014 was a difficult one at Kaaterskill Falls. That summer two people fell to their deaths. It’s a dangerous place; you only have to be careless for a second or two and then the worst can happen. Naturally, everyone involved is quite concerned about the upcoming summer season. We wish these things did not happen, but they do. And there is so little that you can do to mitigate this sort of thing. They have put some new fences up, but they are unlikely to deter people from going into dangerous areas. Some better communications are now available for first responders, and we understand that the site is better prepared to get helicopters in and out of it. But we are concerned about other problems at Kaaterskill Falls, and those are problems that may actually have solutions. Our first concern is the ongoing erosion of the slopes just to the right (east) of the falls. It has been about two centuries now, that people have been coming here in ever increasing numbers. It used to be that the marked Yellow Trail ascended the slope to the right of the falls and people climbed up to the top of the falls that way. But the ground is soft there and, especially when it is wet, the results of climbing are to mobilize the earth. There is no hope for vegetation to take hold here; plants are quickly trodden into the ground. When it rains, the bare earth is likely to slide downhill, just a bit: just a bit today, and just a bit tomorrow, and just a bit next week. You get the picture. The slopes have been eroding for all those two centuries. 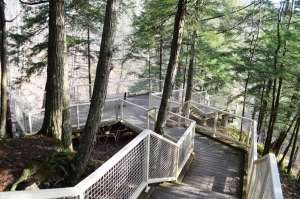 Years ago, the Yellow Trail, above the base of the falls, came to be closed. That probably has helped a little bit, but just a little bit. People still climb up those slopes: we confess; we are among them. It’s not likely that this will stop. Late, last summer, those new fences were put in, but it is hardly likely that these will even slow people down. We posted a photo of one new fence on our Facebook page and the responses were uniformly sarcastic. So, if this is not working, then what should be done? Our solution, and we have been arguing this for 20 years, is that a staircase should be built. That’s certainly not an unprecedented idea. 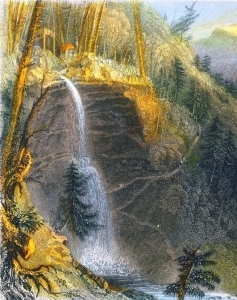 When William Henry Bartlett sketched at Kaaterskill Falls during the 1830’s, his picture showed a staircase from the bottom to the top of the falls. Detail from Bartlett print of Kaaterskill Falls. See staircase to right. But during the last century, this property came to be owned by New York State, and thus part of the Catskill Park. If we understand it properly, park land should not have artificial constructions on it. This land is supposed to be pristine and natural. A staircase would be unnatural, a violation of what is intended. The irony is, of course, that, without a staircase, people do far more harm. So those “pristine” slopes have been slowly and steadily deteriorating for centuries now: with more centuries to come? We hope not. If we are looking for precedents, we do not just have to visit the 1830’s; we can look at a good example today. Have you ever been to Mine Kill Falls? Take Rte. 30 north from Grand Gorge and watch for signs that announce the presence of the falls. There is an ample parking lot and, just below that, you can begin descending a nice dirt trail into the Mine Kill Gorge. The trail will take you all the way to the bottom of the falls. Your boots will do little damage here; the slope is so gentle that you will not trigger any significant erosion. But, there is another trail. Its left fork takes you to a staircase and that staircase takes you to a fine view of the upper Mine Kill Falls. Then there is a right branch; its staircase takes you to a view of the lower falls and the canyon below it. It is a most remarkably picturesque location. And we don’t think you will find that the scenery is harmed in any way by the staircases. You will not likely find this to be some sort of environmental abomination. The steps get people to the upper falls safely and easily. And there is absolutely no erosion going on below the stairs, nor will there ever be any. It is a nice, environmentally sound, solution to a serious problem. Visit Mine Kill and see for yourself. Then imagine some equivalent installations at Kaaterskill Falls. But there is more, there is another problem that we wish to help solve. The two of us belong to the Mountain Cloves Scenic Byways Committee. 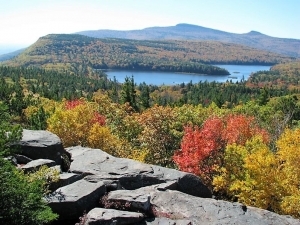 We are hoping to promote greater eco-tourism in our picturesque eastern Catskills. We need a trail system that smoothly transports hikers from below Kaaterskill Falls, past the falls, and on to the Blue Trail that leads to the north rim of Kaaterskill Clove. In short, we want a well-planned trail system that promotes green tourism. We don’t have that now. Today, you can take the Yellow Trail to the base of Kaaterskill Falls and then you are supposed to turn around and go back. Who on earth would want to do that? Our proposed staircase, we hope, would lead on, above the falls, to join the greater trail system. It would be a great lure for tourism in our area. We need it. This is Greene County; our tourist industry has long been deeply depressed. Greene County is a landscape of lost hotels, empty motels, and long forgotten boarding houses. This, the onetime home of the Catskill Mountain House Hotel, now has very few overnight rooms and still fewer people looking for them. We need help and, just maybe, a more thoughtful trail system would be a step in the right direction. That all hinges on a staircase being installed at Kaaterskill Falls. We don’t do a lot of tub thumping at On the Rocks, but we think this is worth the effort.